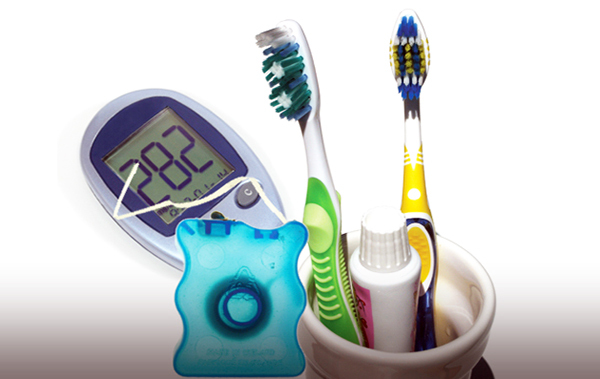 Extensive research connects oral health issues and diabetes and the University of Florida College of Dentistry is preparing tomorrow’s dentists to take steps to diagnose and help care for their patients. Second year dental students in the Treatment Planning course, led by faculty member Alex Delgado, D.D.S., M.S., participated in an interactive session on blood sugar screening and testing of dental patients in September 2018. After an introduction by Valeria Gordan, D.D.S., M.S., director of the South Atlantic Region of the National Dental-Practice Based Research Network, or NDPBRN, about the network and its goals, Denise Schentrup, D.N.P., associate dean for clinical affairs at the UF College of Nursing, provided information on diabetes and its effects on oral health. Joseph Riley, Ph.D., deputy director of the South Atlantic Region of the NDPBR, and Deborah Dilbone, D.M.D., a member of the Practitioner Advisory Counsel of the NDPBRN, presented data from past network studies conducted in dental offices on the feasibility of blood sugar screening in private practice and assessment of medical risk in dental offices. Students were then able to conduct a self-screening to gain understanding of the process on a more personal level. In the discussion that followed, students examined advantages of providing this service to dental patients, assessed which barriers might exist in the process and how to overcome them. Additional College of Dentistry faculty members participated, including Cesar Migliorati, D.D.S., M.S., Ph.D., Patricia Pereira, D.D.S., Ph.D. and Annetty Soto, D.M.D. Members of the college’s staff including Deborah McEdward, Brenda Thacker, Danny Johnson and Margaux Johnson also assisted during the three-hour session, exercises and discussion. 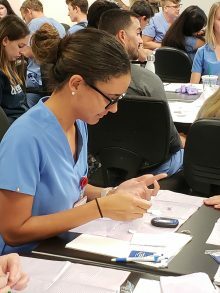 Migliorati explained that the course was the first in a series of steps as part of a broader plan to integrate medical and dental interaction between the colleges of dentistry and nursing to improve the delivery of patient care.